Easter Sunday in Honokaa, 1942. HONOKAA:—Just like the news announced last week in the Hoku o Hawaii, the Easter events were carried out at the church of Honokaa by the Rev. Abraham Poepoe. Easter day was a very nice day here in the Hamakua district and the dawning of this Monday. This is a rainy day, and this is a humid day. However, praised always is God. He knows that it is good for there to be rain and fog these days of war. Ka Hoku o Hawaii, Volume XXXVI, Number 42, Aoao 1. Aperila 8, 1942. 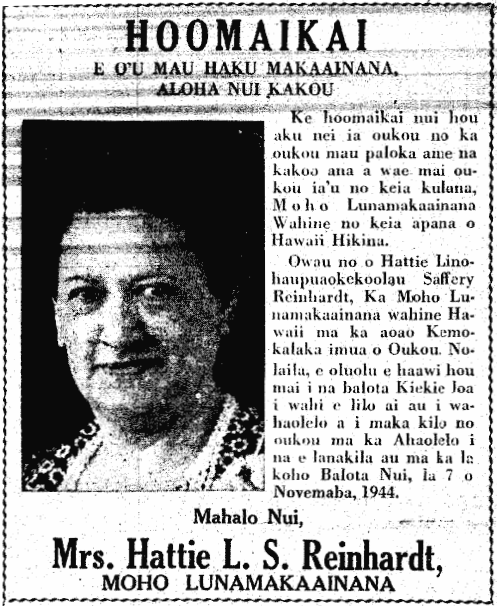 Mother’s Day at Honokaa Union Church, 1942. This past Sunday was the “Day of Mothers.” A commemoration was held at the Union Church of Honokaa by the Rev. Abraham Poepoe and Lloyd Davis of Kohala. Jocelin Poepoe sang the song “Mother” and Poepoe [? Abraham] played the piano. 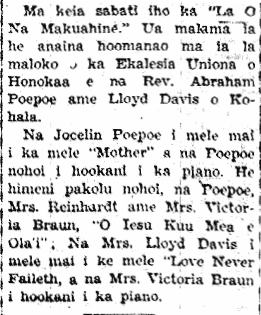 There was a trio with Poepoe, Mrs. Reinhardt and Mrs. Victoria Braun, singing “O Iesu Kuu Mea e Ola’i,” and Mrs. Lloyd Davis sang “Love Never Faileth,” and Mrs. Victoria Braun played the piano. Ka Hoku o Hawaii, Volume XXXVII, Number 3, Aoao 1. Mei 13, 1942.